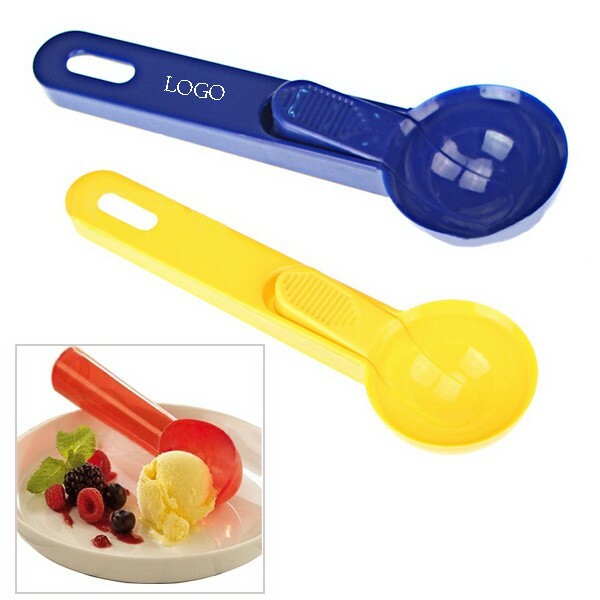 The ice cream spoon is in simple design, made of food plastic material. It used for ice cream dig and make ice cream in ball shape, can be hung with hole on the handle. It is ideal giveaway for bakery, restaurant, hotel event with customized logo. 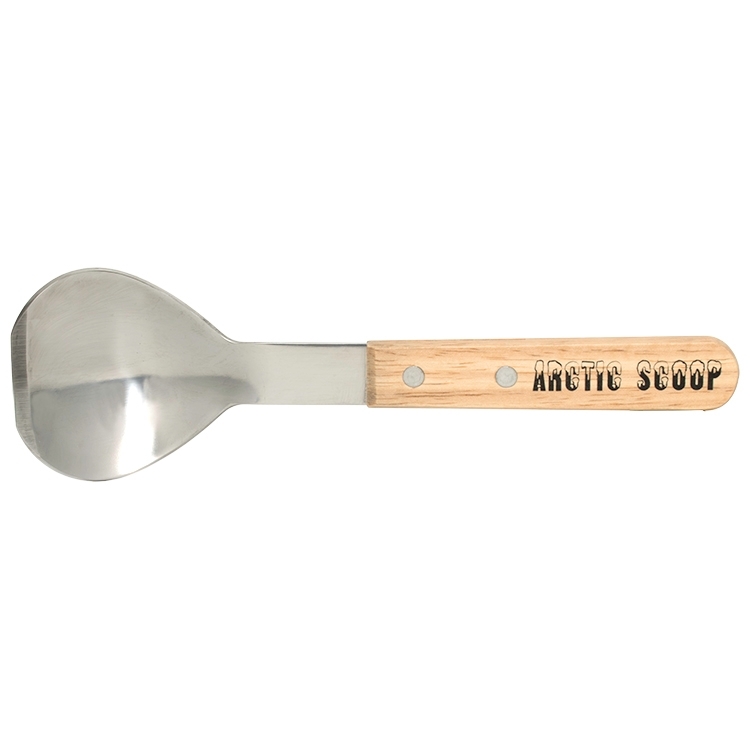 The stainless steel ice cream scoop is made of food grade stainless steel. It is easy to dig out ice cream balls, fruit balls and so on. Suitable for restaurants, ice cream parlours, fruit shops or homes. The size is 1 9/16" D.You can print the custom logo by laser engraving. 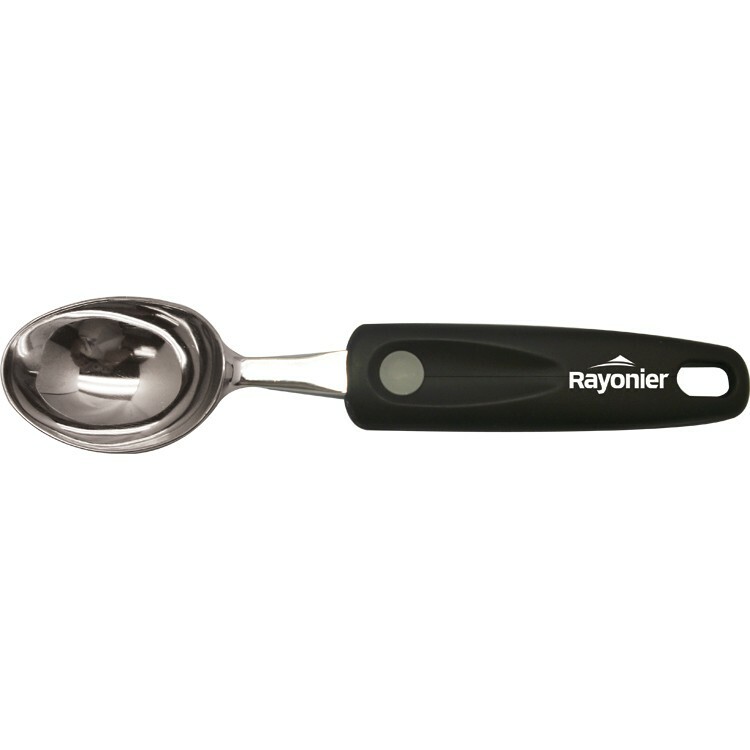 Suitable for hard ice and soft ice cream and biscuits, or any other food. 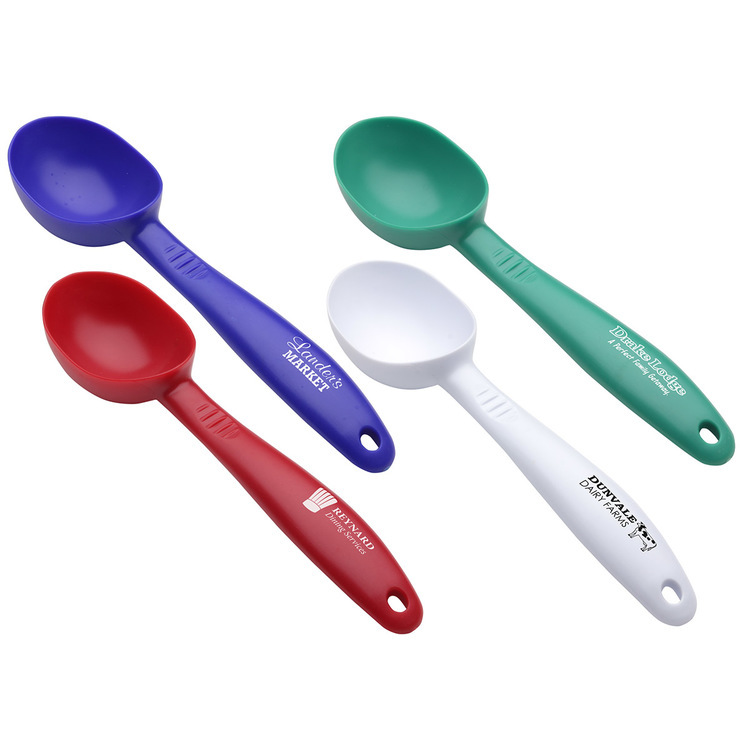 We will use the ice cream scoop to easily lighten Lightly squeeze and release, work hard, you can use them comfortably with your right or left hand. 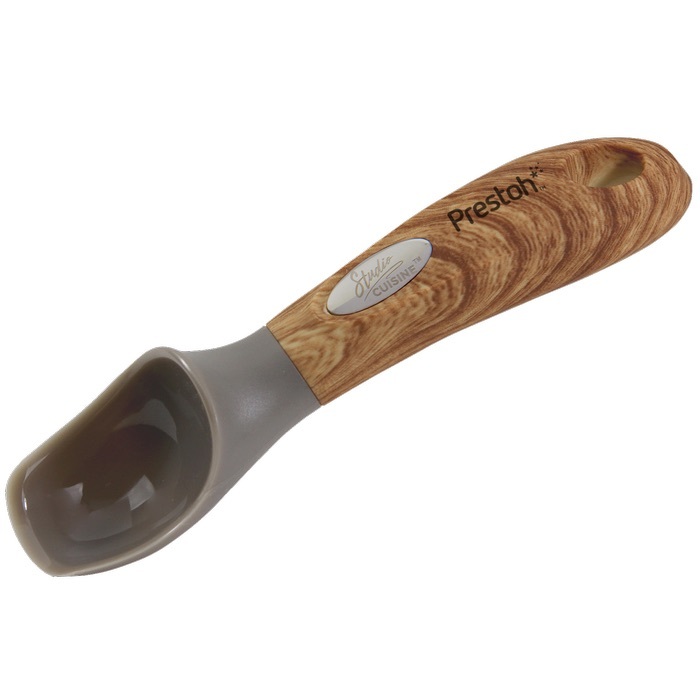 By using this spoon, you can easily create beautiful ice cream, melon, sorbet, meat, fruit and more healthy food. Food grade material safety Reliable.Send a detailed quotation request. Closeout Item. Supplies are limited. A Great Way To Advertise! 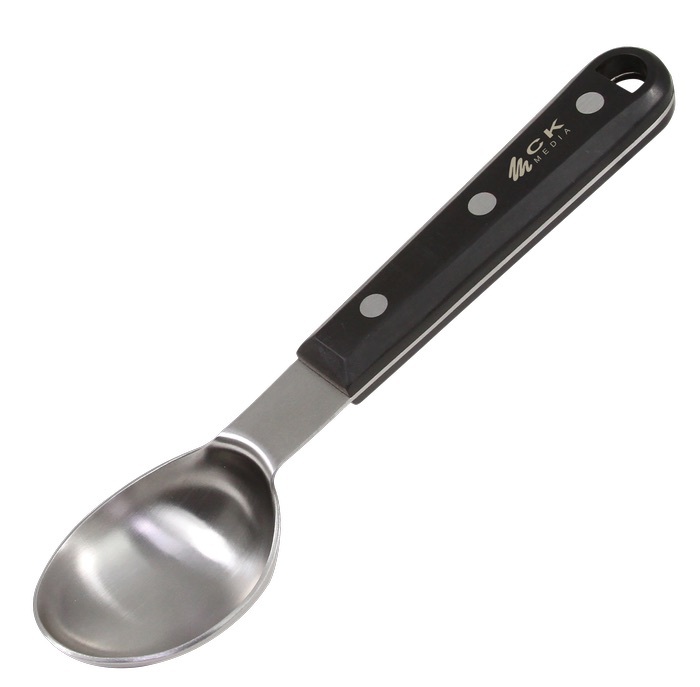 Metal 8 1/4" x 1 3/4" metal ice cream scoop with black plastic handle..
Also good for sugar, flour and other bulk items. Ice Cream Scoop. Comes in Orange, Green, White, or Blue. Features look for gripping and hanging. Hand washing recommended. 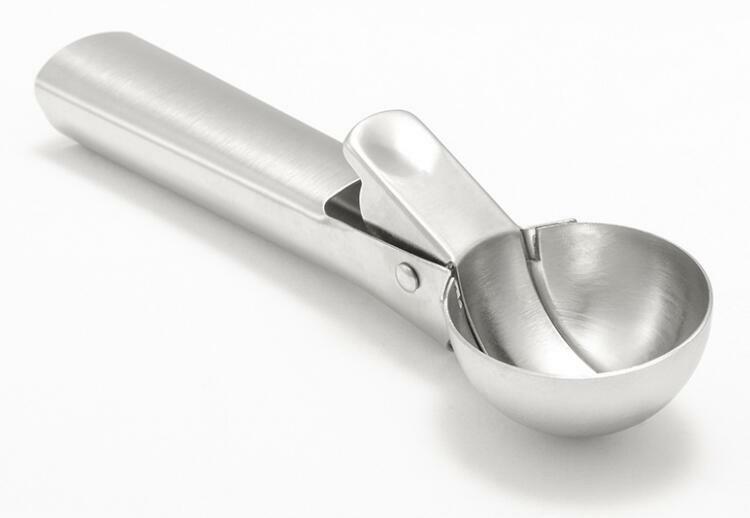 Ice Cream Scoop made of Aluminum 100%. It's a great product for restaurants, hotels, bars and many places. We can make logo as per client's requirement. 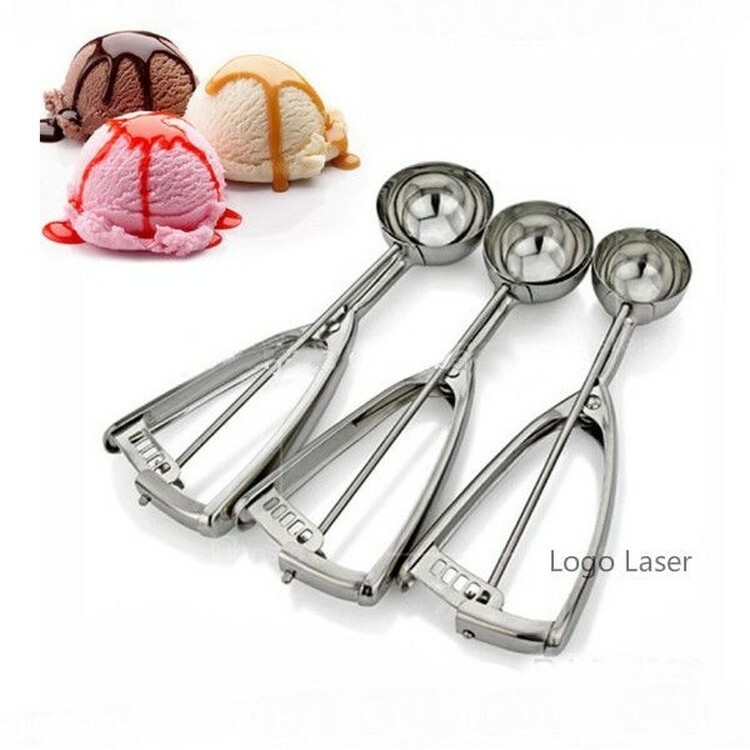 The stainless steel ice cream scoop is made of food grade stainless steel. It is easy to dig out ice cream balls, fruit balls and so on. Suitable for restaurants, ice cream parlours, fruit shops or homes. The price is 1 9/16" D. The order is the shipping price. You can print the custom logo by laser engraving. Suitable for hard ice and soft ice cream and biscuits, or any other food. 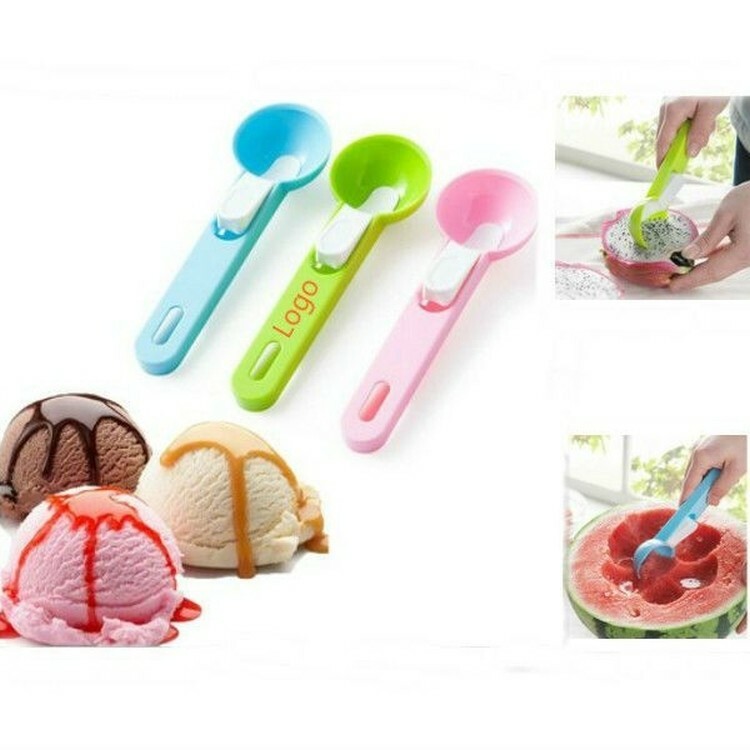 We will use the ice cream scoop to easily lighten Lightly squeeze and release, work hard, you can use them comfortably with your right or left hand. 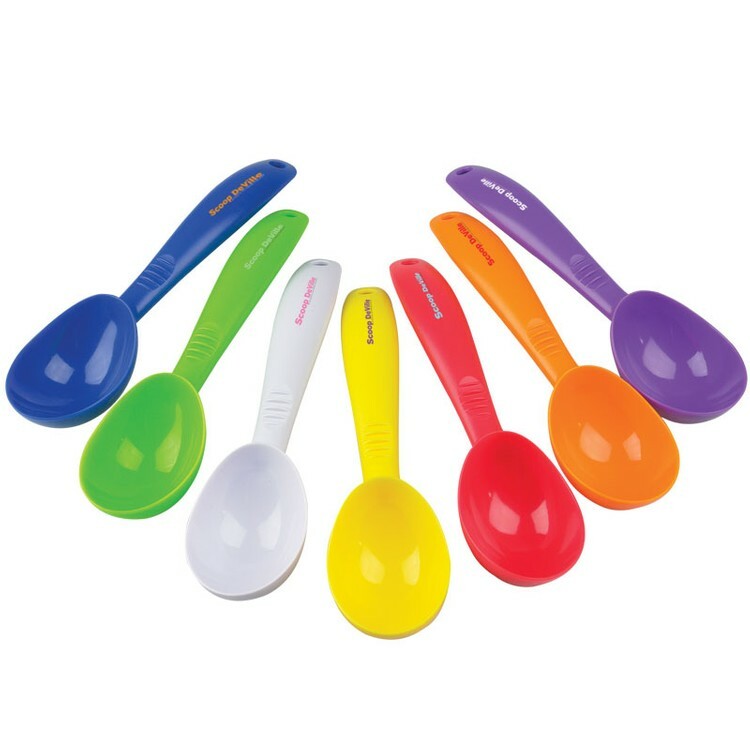 By using this spoon, you can easily create beautiful ice cream, melon, sorbet, meat, fruit and more healthy food. Food grade material safety Reliable. 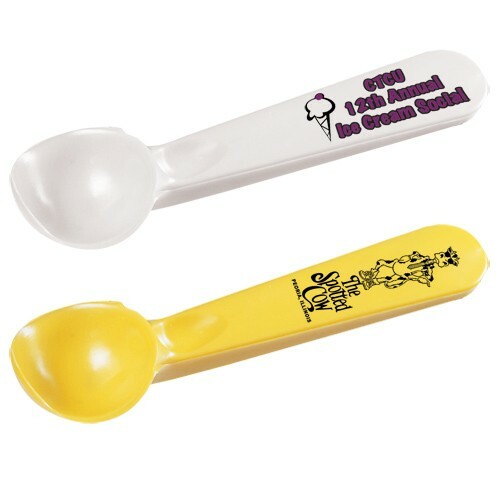 We also offer ice cream spoon sizes of 1 3/8"D, 1 13/16"D, 2"D, 2 3/16"D, 2 3/8'D. Please feel free to ask. Send a detailed quotation request. 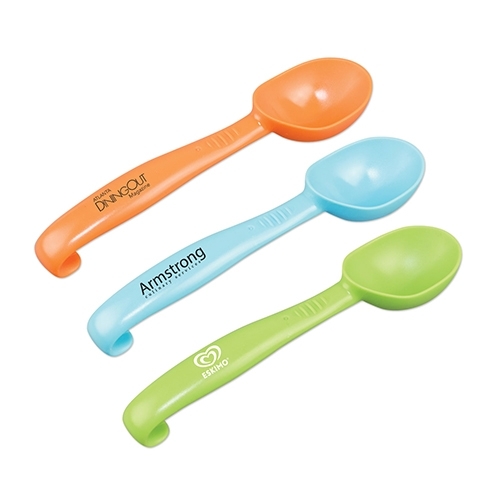 Ice Cream Scoop with comfortable contoured grip, bright fun colors, solid and durable construction. Great for any promotion. Your message will be read every time something good is about to happen! Linking positive emotions to your brand. Dishwasher-Safe - BPA -Free. 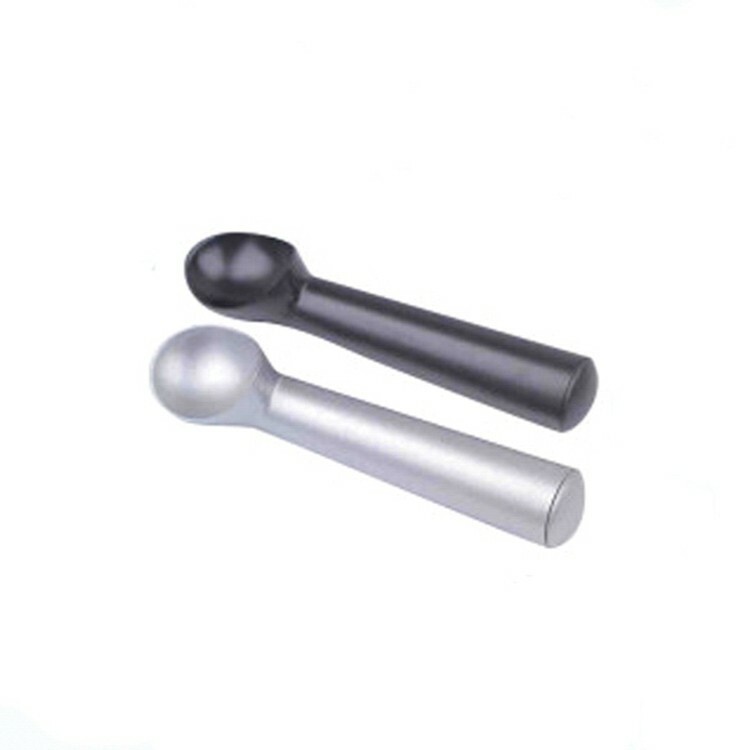 Push type ice cream scoop is made of stainless steel. Custom logo can be Laser Engraved. 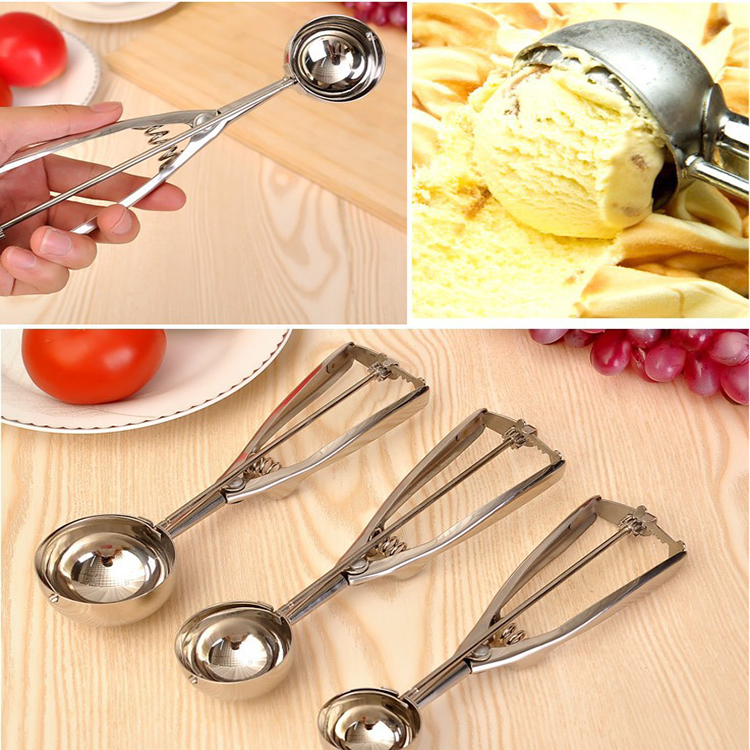 Aluminium alloy ice cream scoop made from food safe materials. We can make any size for your request. Host an ice cream social at your company for the public to come and enjoy (and to learn more about your company). 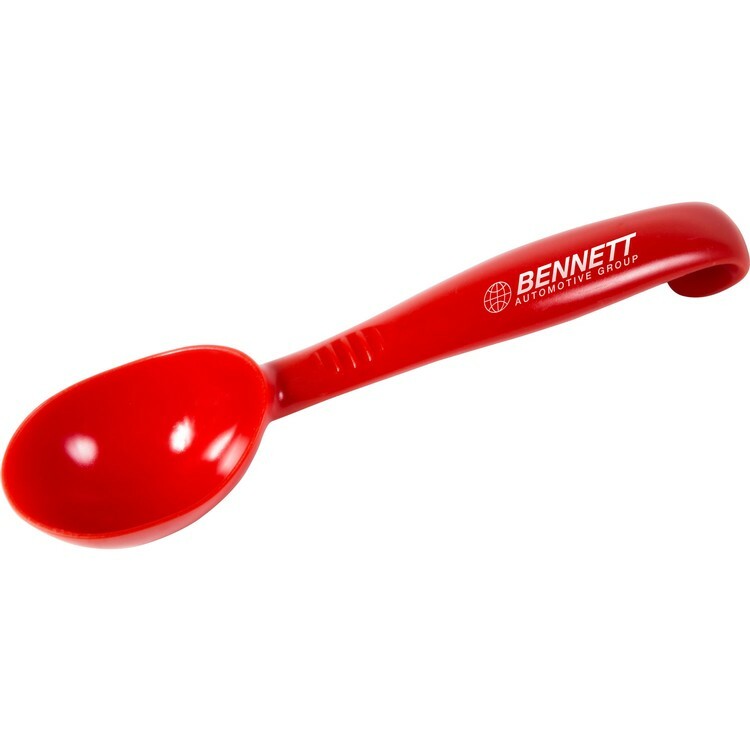 When they leave, hand them one of these promotional ice cream scoops and they'll be sure to remember the event and your company too! Maybe you want to have a fun wedding favor? 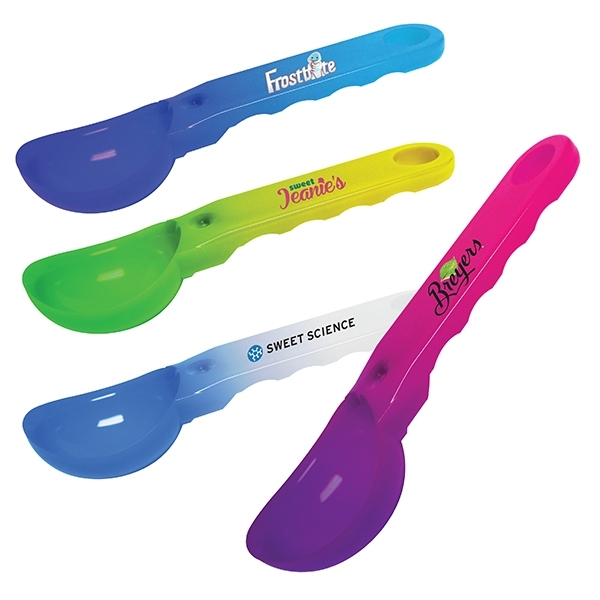 These custom ice cream scoops are definitely fun! Made from stainless steel for added durability. Each one is individually boxed already. Your customers won't be able to ignore how great your company is. 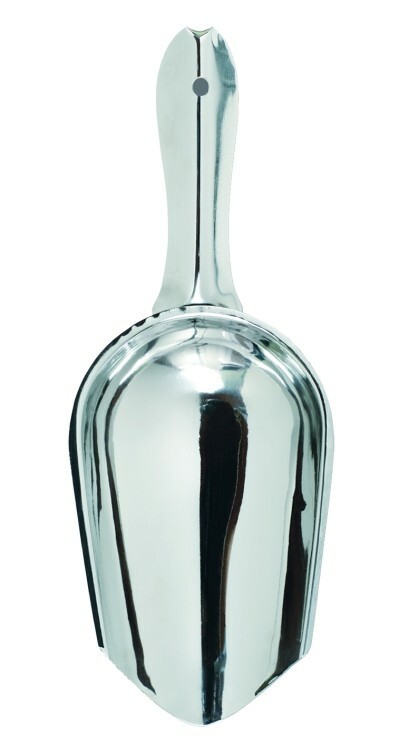 Made from premium food grade stainless steel. 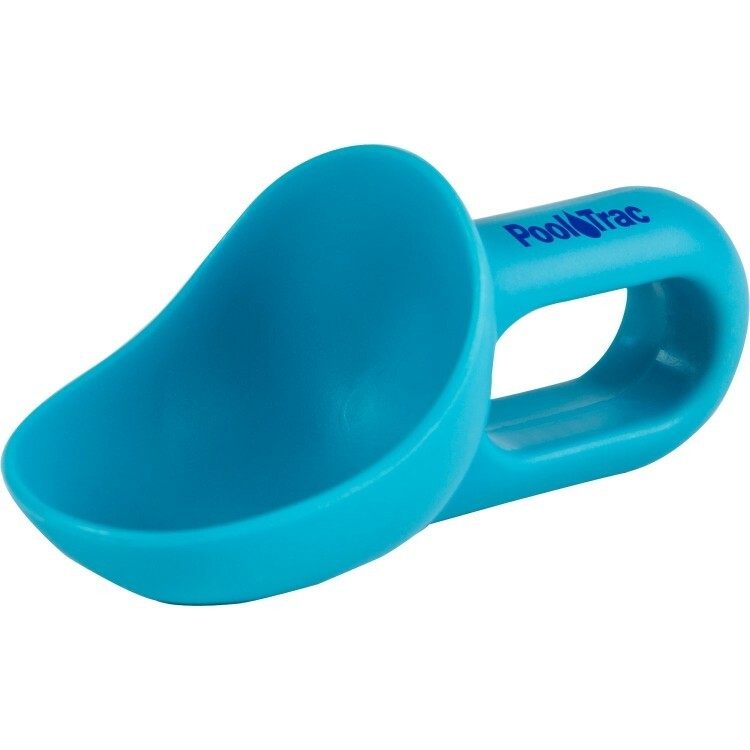 It`s easy to squeeze and emptied the ice cream. Check out our new line of kitchen tools! 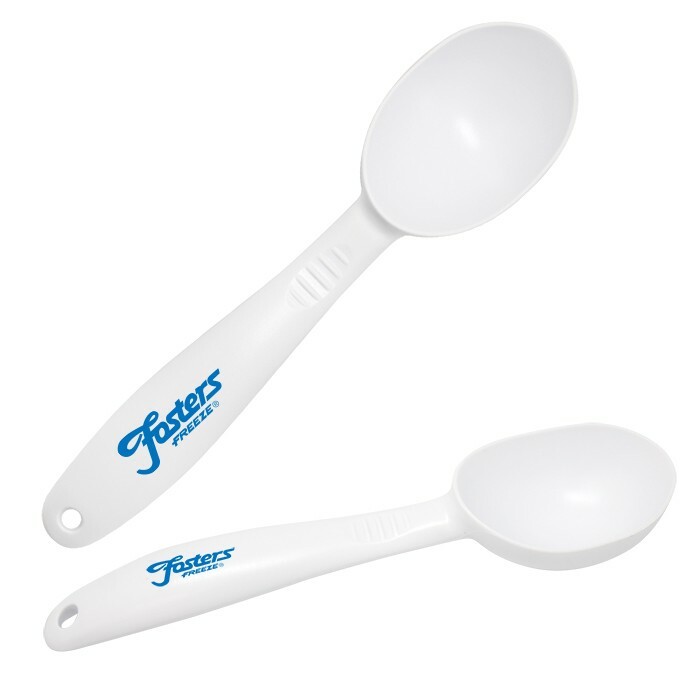 Our ice cream scoop is FDA approved and dishwasher safe. Great for your local ice cream shop, restaurant, bakery or cooking school. 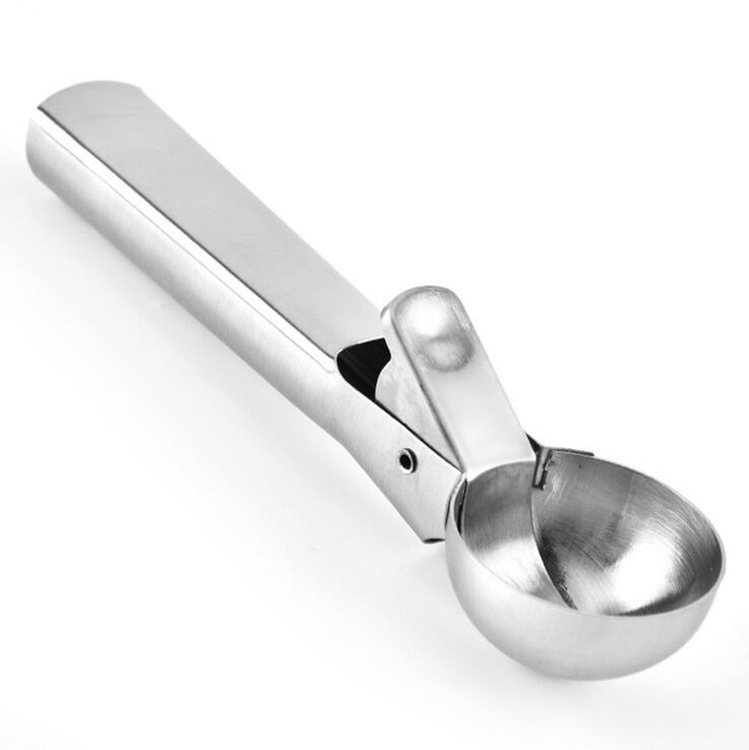 This ice cream scoop with trigger is made of good quality stainless steel. 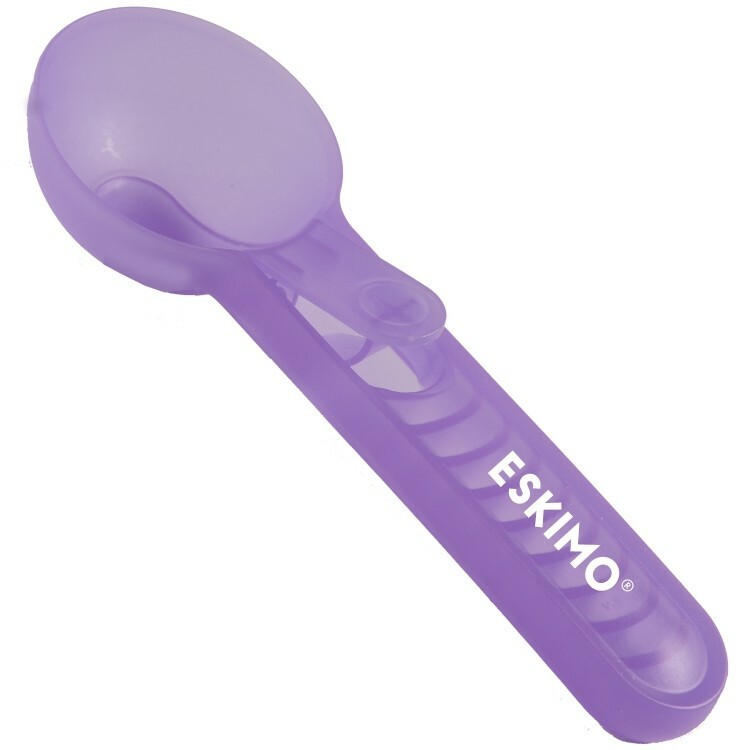 The scoop makes it very easy to scoop ice cream, gelato or frozen yogurt. Your logo is welcome. Price includes freight charge. 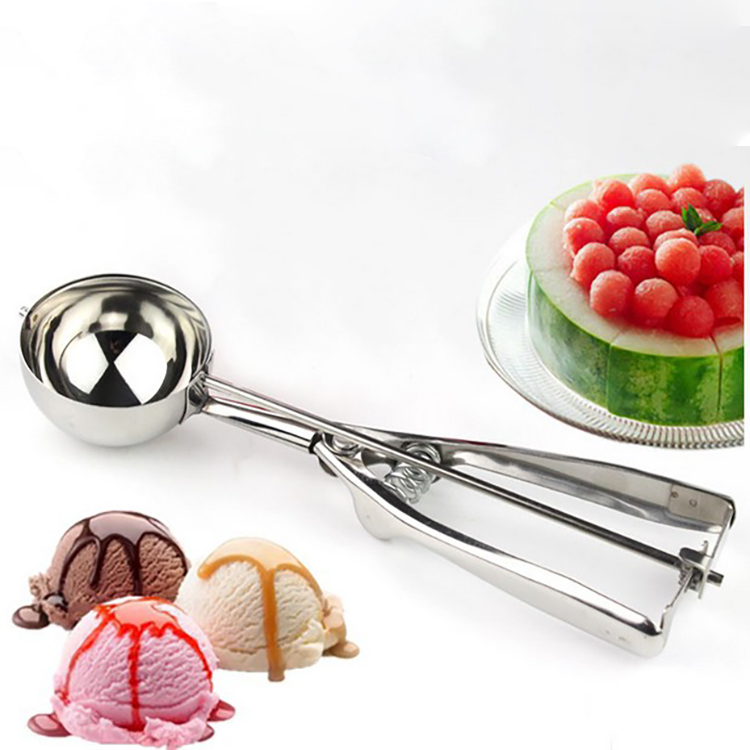 It's a new arrival ice cream scoop with new type and new feature. You just need to press the handle the ice cream will slide down very easy. 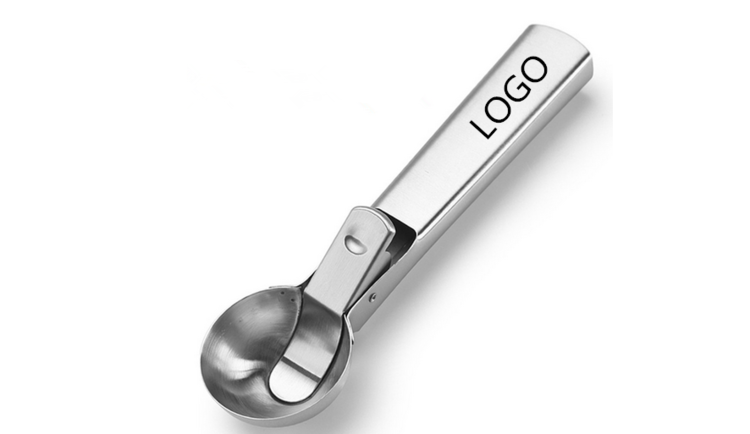 We can make your branded logo on the handle as per your request. 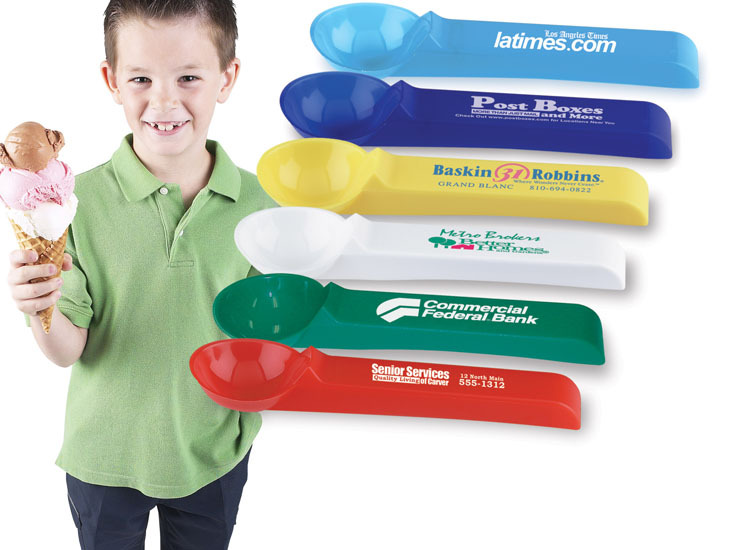 You can give your customers a big old scoop of promotion with these outstanding promotional gifts! Add your logo or slogan, and every time your clients prepare their favorite summer treat, they'll see your custom message! 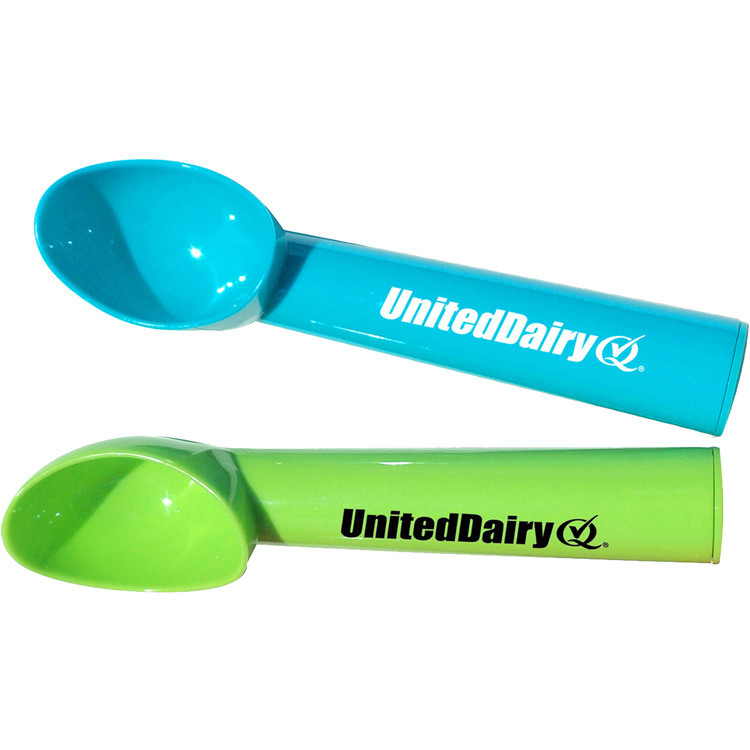 Your customized Ice Cream Scoop features a rugged design that makes scooping out the hardest ice creams a breeze. 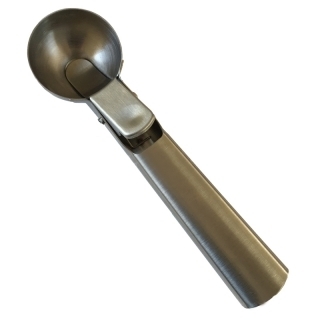 Each boasts a push lever for improved release of ice cream, and is ideal for corporate picnics, company parties and ice cream shops. 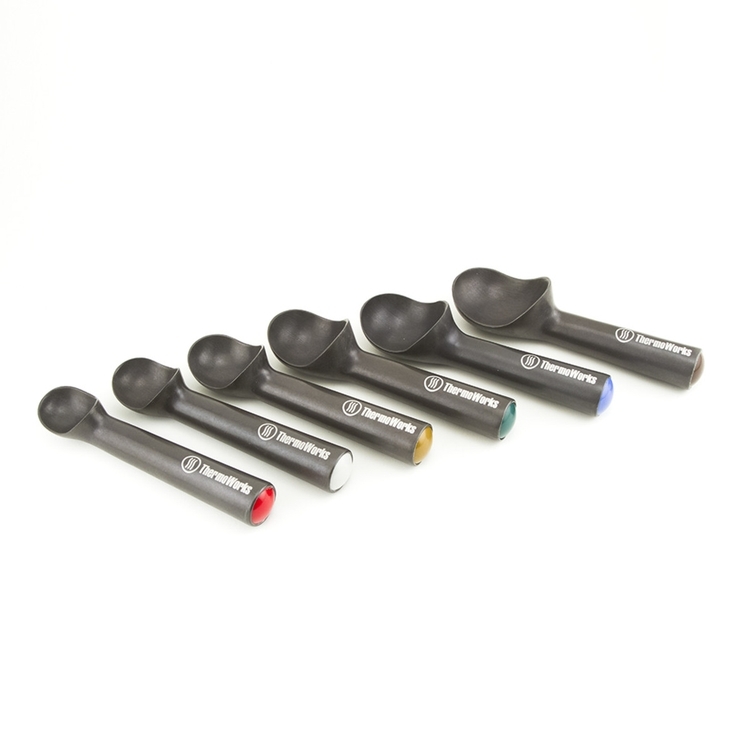 Personalize your scoop.